It is so great to see mutton back on the menu. Mutton has long taken a back seat for spring, or young lamb which is quicker and easier to cook. 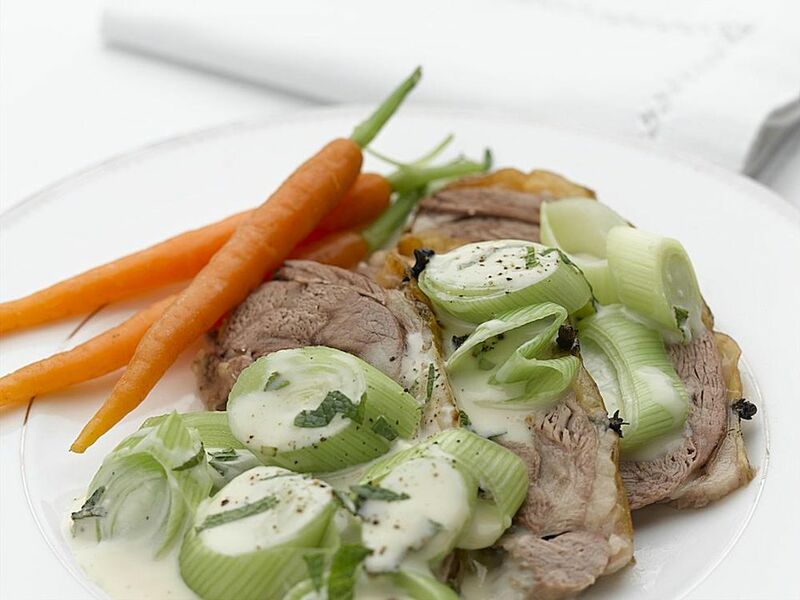 Mutton, on the other hand, is a terrific meat and works best, long, slow cooked and as here with a Braised Mutton with Creamed Leeks and Mint Sauce recipe. This recipe is not only a celebration of mutton, it is also a super celebration of the great British leek. Leeks are a great vegetable and are used right across British and Irish food not only as a vegetable in their own right, they play beautifully in stocks, sauces, soups as a supporting ingredient adding flavour and texture. Leeks are celebrated throughout Wales on St David's Day as they are an emblem of the country. Start by working out the cooking time which is easy to do. Allow one hour and a half for every kilo. Pop the mutton skin-side up in a roasting pan. Make tiny slits to insert the cloves all over the skin of the meat. Tuck the braising ingredients around the mutton in the pan add boiling water to half way up the meat and cover with a piece of baking parchment tuck in making sure it covers everything in the pan. Braise for your calculated time in the preheated oven. Keep an eye on it as it cooks and add water if needed. Once cooked, skim the fat from the braising juices and reserve 300ml as in the ingredients list for the sauce. Rest the meat for 30 minutes before carving into thin slices. Simmer the leeks for 3 – 4 minutes or until just tender. In a saucepan, melt the butter over a gentle heat, once melted stir in the flour. Gradually add the reserved braising juices and milk whisking continuously until the sauce is simmering. Season and add the mint and leeks. And don't forget the health benefits. Eating lots of leeks has been shown to reduce ‘bad’ cholesterol – and at the same time increase levels of ‘good’ cholesterol and stabilise blood sugars, and are an excellent source of manganese and vitamin B6, vitamin C, folate and iron. This recipe is based on one from British Leeks, reproduced with permission.